Bed bugs are, unfortunately, a far too common problem in households all around the world these days. Bed bugs don’t discriminate either, both poor and wealthy households become infected with bed bugs every single day. From mattresses to furniture, bedbugs are a nuisance and can occur in any environment whether clean or dirty. Although, disorganized and cluttered homes are more prone to having them as there are more places for them to hide, and reproduce. Bed bugs are known to hide in various places such as carpets, bed frames, bedding and clothes and many other locations. That is why hotels, homes and even cars and buses may be infested with bed bugs. Given bed bugs can survive long periods of time without feeding and have have life spans of between 6-months to two years, bed bugs can turn out to be a huge problem, and quickly too. This problem can escalate even further as females can lay up to 500 eggs in their lifetime. Bed bugs are known to stay where their host is. Transfer occurs through furniture, clothing or luggage that is relocated from one place to another. That is why many places such as school dormitories, hotels, motels and bed & breakfasts often have bed bug infestations. Hotels are one of the most commonly infested locations. Bed bugs are small, and often hard to notice and thus avoiding them can prove very difficult. One huge mistake that people make, that often leads to getting bed bugs is using second hand items such as furniture and mattresses. We recommend avoiding using used furniture if at all possible. If not, be sure to thoroughly inspect it using our inspection process. If you have used furniture that you know contains bed bugs or if you even think it might have bed bugs, clearly label it before disposing of it. Using red spray paint and saying “Bed Bugs, do not use” can really help to avoid spreading them to someone else. The introduction of the renowned insecticide DDT in the middle of the 20th Century saw bed bug infestations reduce considerably. Recently though, there has been a large onset of new and ineffective bed bug control measures that have proven futile in efforts to curb the growing bed bug problem. Unfortunately, most of the pesticides are made with making money as the primary objective. Due to the wide array of these ineffective but costly products, it is hard to tell which ones work and which do not (one of the main reasons this site was started!). To learn what treatment methods really work, visit our Bed Bug Treatment page. Bed bugs are very resilient and as such insecticide sprays are generally not effective, especially the normal ones used for ticks, mosquitoes, and other bugs. Products like Raid and Hot Shot come to mind. There are spray products that do work, and you can find our top recommended bed bug sprays here and more information on bed bug sprays in general on our sprays page. Due to a large amount of false and misleading information, along with a small amount of effective methods of control, the bed bug problem has become an epidemic and various professional associations have been created to help deal with it. The bed bug problem is so widespread, especially in larger cities, that local legislation regarding the problem has been passed and is being enforced. The bed bug problem is so bad, many are referring to it as the modern day plague. Though bedbugs are not necessarily caused by the lack of cleanliness, clutter can enhance the changes of a bed bug infestation as they will have more places to hide. Hiding gives them more of a chance to reproduce and increase to large numbers without being noticed. The longer the problem goes on, the more difficult it is to treat. Keeping your home organized and free of clutter can really help in managing a problem, but it does not eliminate the chance of it occurring. Avoiding clutter will help you recognize the problem sooner, and help keep it from getting as bad nearly as quickly. In addition to avoiding clutter, be sure and familiarize yourself with our bed bug detection methods and how to find bed bugs in your home. A common bed bug misconception is that you’ll know you have bed bugs due to having bites on you – some people have no reaction when bitten. So educate yourself, even if you don’t think you have bed bugs. One of the most common ways to spread and get bed bugs is by traveling. Since bed bugs are transferable from place to place, the rise in travel around the world today has seen the transfer of bed bugs from one part of the world to the next. With travel from country to country and even across continents becoming less and less regulated, there is a constant movement of bed bugs from more prone to less prone areas of the world. Consider this, let’s say you decide to take a vacation in a foreign country. You fly over, and the first hotel you stay in has a bed bug infestation. While you are sleeping, they invade your luggage and clothing. Over the course of your trip you stay at five other hotels. The bed bugs spread from your luggage into each hotel room. On your way home, as your checked in luggage sits next to other people’s luggage, the bed bugs spread to those as well. Then you get home, and while unpacking they spread into your bedroom, bed and furniture. Not to mention, they probably spread into your car too. Unlikely? No, not at all. What’s really scary in this scenario isn’t just what happened to you, but the effect this spreading will have on other people as they stay in the same hotel rooms. The spread becomes exponential, and serves as a good example of why we have the bed bug epidemic we have today. How do you avoid this? Not traveling is the best way, but we understand that isn’t reasonable. Instead, make sure you inspect your hotel room BEFORE you even bring your luggage into it. We recommend leaving your luggage outside or at the very least in the bathroom tub, while you inspect your room. If you find ANY signs of bed bugs, ask for another room in a different area of the hotel, and report your findings to management immediately. 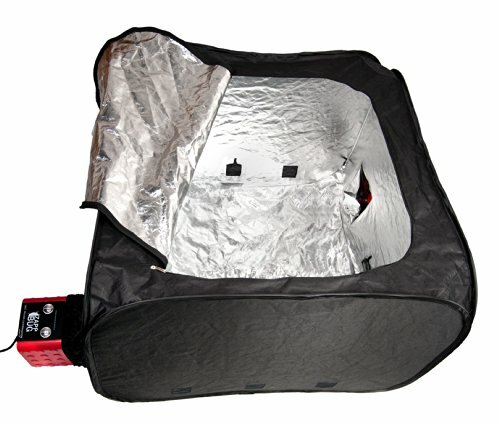 The ZappBug Oven is designed to heat treat clothes and luggage to kill bed bugs before they can enter your home. If you travel often, we highly recommend one to treat your luggage when you return home. Bed bugs like warm conditions, and any surface that promotes warm temperatures are prone to become their habitat. Plastic and metal surfaces can reduce the amount of bed bugs that live in a place since they do not promote warmth. Fabric and wood however are the perfect breeding grounds for bed bugs. Replacing wood and fabric surfaces with plastic and metal surfaces can reduce your risk of infestation and population growth. These surfaces have the additional benefit of making the bed bugs easier to detect as well. Bed bugs are very speedy crawlers and can easily move from one building to another through holes in walls and around plumbing. This is one of the reason, bed bugs are so problematic in apartment buildings and hotels. Because they are very small, discovering them is often nearly impossible on your own. Finding bed bugs in town homes, apartments and hotels often requires a trained bed bug professional. One of the things you can do to help prevent this spread is to fill any gaps or holes in walls. Spray/foam insulation is a great option for this. Filling cracks, holes and crevices with this easy to apply material will not only help minimize the spread of bed bugs, but will also insulate your home or business better too. In additional to filling holes, we also recommend putting Diatomaceous Earth around these locations, so that bed bugs will get covered in it as they crawl around the area, and eventually die. In most nations, cities are the most densely populated places with people migrating from rural areas into the cities. With this migration, comes the transfer of bed bugs in large numbers which is why urban areas are the most infested areas by bed bugs. Again, since bedbugs are attracted to warm conditions, the crowding of many people in small spaces enhances their breeding conditions. This is why crowded hotels and apartment complexes make some of the most infested places. Bed bugs also thrive it cities due to the amount of food (lots of people and animals), places to hide, and ease of moving from one area with food to another. Hotels and motels are some of the most infested locations in the world, primarily due to the high turnover of people staying in them. People are constantly checking in and checking out, resulting in bed bugs also checking in and checking out. Those people then transfer those bed bugs to other hotels and homes. So long as people are moving in and others moving out, there is a greater risk that someone will come in or out with a few bed bugs. But out of all these places, what is a bed bugs favorite location? Your bed. A mattress and box spring is one of the most optimal breeding places for bed bugs. A single mattress can be a habitat a very large number of bedbugs – thousands. Bed bug infestations in mattresses are often so bad, it’s just best to throw the mattress out. This of course leads to someone finding the mattress, not realizing it’s infested, bringing it home, and then infesting themselves with bed bugs. This happens far more often than you would think. Covered mattresses are the best way to both protect your mattress from getting bed bugs, but to also kill any bed bugs you may have in your mattress. Special be bugs mattress covers kill any bedbugs in the mattress and hinder any more from infesting it. Though they have become quite a nuisance, bed bugs are not impossible to beat. There are many professional pest controllers that can be engaged as well as many treatment, preventive and control measures that can be applied on your own to rid your home of bed bugs. One the most important steps you can take to keeping bed bugs out of your home is practicing proper inspection and detection. Finding bed bugs in your home early and treating them quickly can be a critical step to avoiding an expensive and complex bed bug infestation!